Next Monday (8/21), we are going to start planning the 7th Annual March to Stop Executions on Oct 28 in Austin. If you are in Austin, you can come by the weekly CEDP meeting next Monday where one item on the agenda will be the first planning discussion about the march. The meeting is August 21 on the UT campus at 7pm in Pearce Hall, Room 2.404 on the ground floor. Here is a news story on last year’s march. It contains a link to a video on the march. Another news story. If you can’t make the meeting, you can always send ideas and other comments about this year’s march to the maustin list. Something we will be deciding next week is the start and end places for the march, so if you liked last year’s start at City Hall, let us know, of if you prefer Republic Park, as in past years, let us know that too. Also, did you like ending up opposite the governor’s mansion, like last year, or would you prefer other places, like the court of criminal appeals, where we have had ended it a couple of times, or the south steps of the capitol, or somewhere else? As always, we look forward to working with everyone on the march, to seeing lots of people in the movement together again in Austin and to making a lot of noise at this year’s march. Maybe we can focus attention on the three cases of probable wrongful executions that have been in the news a lot since last year’s march. By the day of the march, we will have heard back from the Tides Foundation about whether they are going to approve the grant application that we just submitted to them for $50,000 as a joint application from the anti-death penalty groups that have worked together on the march all these years, CEDP, TMN, TDPAM, TCADP, TSADP and Victims of Texas. Representatives from each of those organizations held a series of meetings over the past six weeks to write the grant. 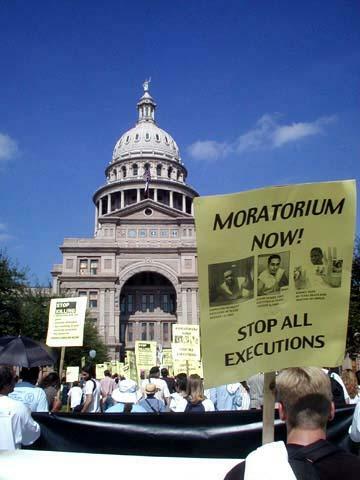 The grant was for a campaign to win a moratorium on executions in Texas by 2009. In the application, we wrote that “our campaign features a program of statewide education, organizing, and networking events to be conducted throughout the year. We will engage in systematic outreach and grassroots organizing designed to persuade the Texas legislature of the need for a moratorium on executions and the creation of a commission to study the death penalty”. If the grant is approved, then 2007 is going to see some major strides in anti-death penalty organizing in Texas. We are optimistic that the grant will be approved. After all, you would think they would jump at the opportunity to fund a serious campaign against the death penalty in the one state where the most executions take place, but you never know. We expect to hear back from Tides by mid-October.